Photos, newspaper article and poem supplied by The Living Archive. The 19th century new town of Wolverton was built to accommodate a major railway works which was in 1914-18, and until relatively recently, the biggest employer in the area that is now Milton Keynes. 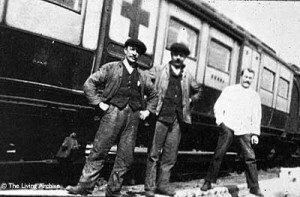 So when the men at the railway works applied their skills to the building of an ambulance train – an exciting new idea to alleviate soldiers’ distress in wartime – its completion was a special event for the whole community. But, as the poem below shows, the celebrations were marred, for at least one participant, by class rivalries which had not been suspended for the duration! A new Ambulance Train for use in France will be on view to the Public in the Carriage Works at Wolverton from 2 pm to 5.30 pm on Saturday the 25th March at a charge of 6d. per person. The money collected from this source will be added to the Works Relief Fund. 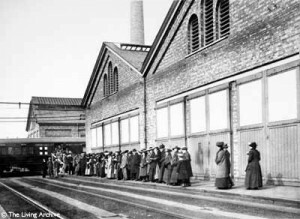 The entrance to the Works to view the train will be at the gates on the Stratford Road opposite the Workmen’s Social Club and the exit after viewing the train, the gates near to Messrs McCorquodale and Co’s Printing Works. Tickets will be issued to persons viewing the train at the entrance gates and collected on entering the train. The whole train is painted khaki colour outside and this has given rise to the popular name in the Works of the “Khaki train”. A large red cross on the outside of each vehicle indicates beyond any possibility of mistaking the purpose of the train when it is in use. The interiors of the open coaches, corridors, cooking and store compartments, mess rooms etc. are all painted with white enamel and designed so that there are no corners where dirt may accumulate on the floor. The train throughout is steam heated and electrically lighted. Special candle brackets are also fitted, in the event of the electric light not being available from any cause. Electric fans are provided for the comfort not only of the patients but also of the doctors, nurses and staff. 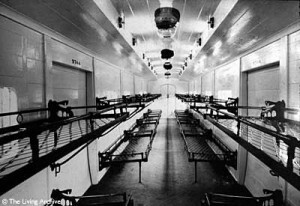 In the ward cars for lying down cases, cots are arranged in 3 tiers. Above each tier is a plate indicating the number of cots. Eight of the cars have 36 beds each and the other has 18 beds. At the end of the latter car are also the guard’s compartment and living room. The beds are of the folding type attached to the side of the coaches. Double doors are provided to all lying-down patients’ cars in order that stretcher cases can easily be dealt with and there are plenty of windows and ventilators. Thoughtful provision is made for the needs of the patients in the shape of portable electric fans, paper racks, ash trays, spittoon holders and other details. Each ward has its own drinking water tanks, cupboard and dresser and lavatory. The ward car for the sitting up infectious cases has no upholstery; the seats and backs are of three ply wood which can be very easily washed down and kept free from germs. The kitchen and mess room is mainly for the use of the staff, and includes accommodation for the field officers’ kit, a mess room, cooks’ room with three beds, and a large kitchen, fitted with Army Service range, refrigerator, crockery racks, etc. The kitchen and stores car is practically the same as this, except that the steward has his storeroom in this vehicle. The brake and stores car carries the guard who has his living room in an adjacent compartment. The remaining space is utilised for stores. The staff car is reserved for the doctors and nurses. 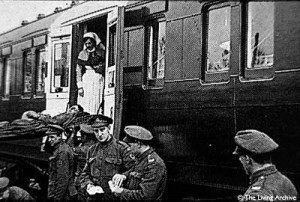 The doctors’ compartment being at one end of the coach and the nurses’ at the other. Dining and sleeping accommodation is set apart for both. The pharmacy car will perhaps attract as much attention as any on the train. 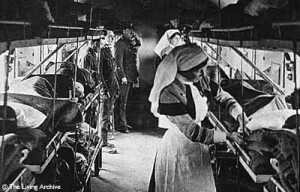 It includes a medical comforts’ stores, an office for the Officer Commanding with safe, writing desk and other fittings, a treatment room (zinc lined) with operating table, appliances etc., a fully equipped dispensary and a linen store. The personnel car for the use of the crew of the train will seat 56 men with the upper berths dropped to form back of seat and will sleep 28 when the upper berths are in position. All the cars used by the staff and personnel are fitted with a special self–heating equipment so that they are independent of the ordinary steam heating system. The Wolverton Works War Relief Fund got £73.9.10d. in three and a half hours. Was quite a crowd of men. To view the Ambulance Train. The charge was sixpence each. To help the “Soldiers Relief”. And all kept clear of the gutter. By touching the common worker. A sting that’s going to abide. That they and the workers are one. And they become one of the crowd. And not above the clouds. Than the one who looks down on you “Proud”.